The fireplace is the heart of the home as people meet around it and there is a friendly, reflective atmosphere. So it is the pivot, starting and ending point to furnish the house, though it should not be regarded as a static element. 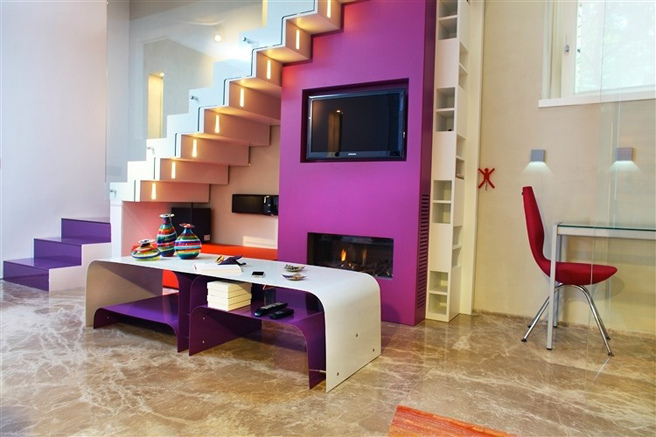 Transforming the fireplace area by using colours can be the right thing to do to revamp the whole living area. Oil-based paint: not recommended for the fireplace area as with the heat it tends to react, thereby altering the original shade and creating cracks. Eco-friendly/natural paint: durable and scented, it is ideal against allergies and easy to apply. It is usually more expensive than synthetic and water-based paint, but ensures a much better performance and provides a much better covering effect. It can also be applied in winter without having to allow ventilation through the rooms, as it does not release toxic substances and vapours. As for the choice of the colour, this largely depends on your own personal taste. While up until some years ago the palette of colours for interiors had just a few shades, today you can simply use any colour. In this sense, the example set by top designers such as Karim Rashid, the first who broke with the past in the use of colour for interior design purposes, can help us. In the wide range of colours available, it is best to keep a few rules in mind, as colour directly influences the perception of space. For instance, warm colours tend to expand space, while cold ones shrink it. Neutral and white colours are suitable for large surfaces. For instance: to expand a room, you will just need to paint a wall in the foreground with a strong colour, thereby “moving away” the walls at the other end with light colours. 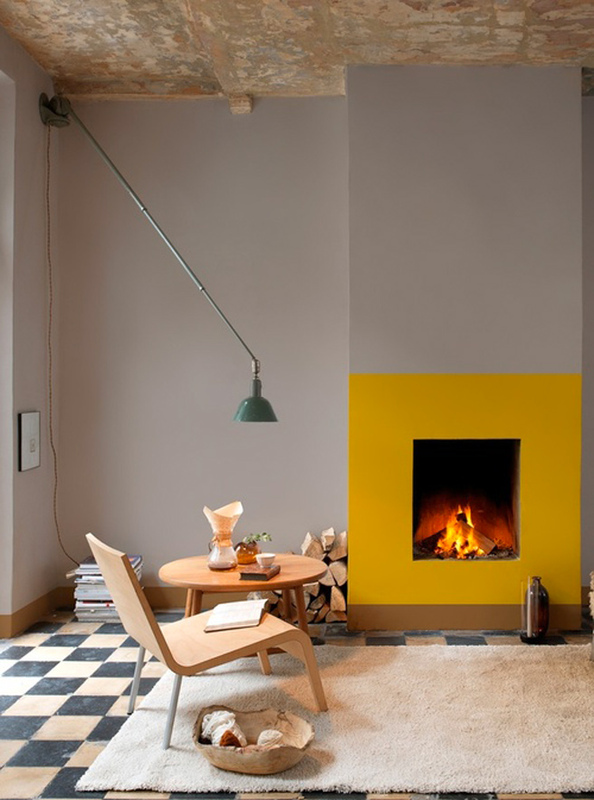 Conversely, the importance of an imposing volume, such as the protruding wall of a fireplace with a full height hood, can be reduced by using grey tones that tend to flatten or, on the contrary, it can be highlighted with a strong colour. Clichés aside, the colour works together with the context it is inserted in and can take on very differing values. Let's start with a few examples. 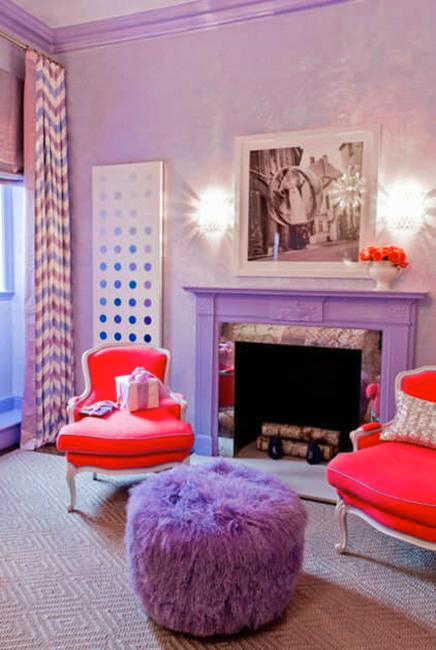 The palette of pink, a typically feminine colour usually associated with beauty and charm, takes on an almost childlike trait if used on all surfaces, from the fireplace to the furniture. 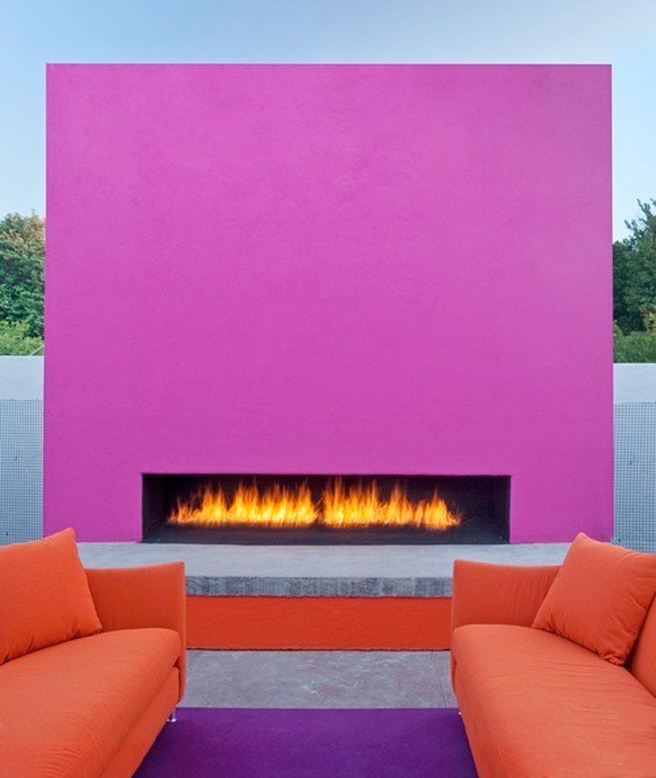 On the contrary, it can become audacious and bold in the hot pink version, where the fireplace becomes a coloured monolith, almost hinting of the Mexican architecture of Luis Barragán. Finally, it can be used to divert attention and provide an energetic connotation to a minimal and potentially dull setting. 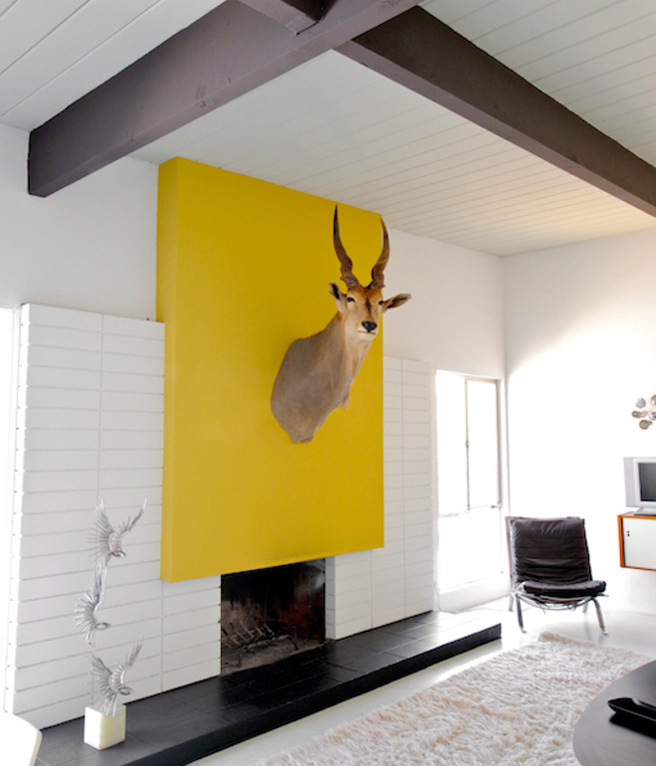 Yellow, which is cheerful and energetic, is a choice with a strong visual impact. 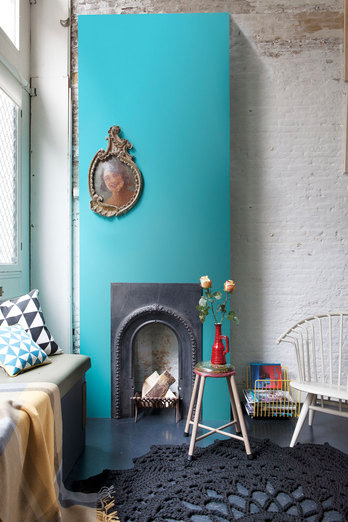 This is a colour that turns into warmth, regardless of whether the fireplace is on or off. It adapts to rooms with a traditional style, slightly shabby chic touch and homes with a contemporary minimal design. 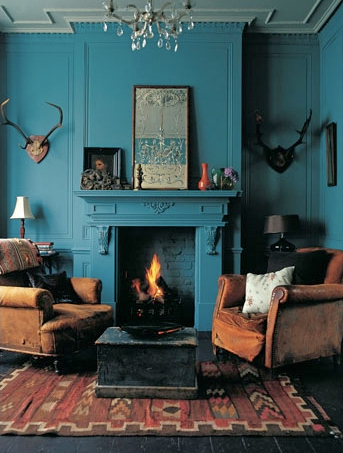 Now let's enter the world of petrol blue, one of the most popular colours in recent years. Here below are two examples where this shade has been used in different ways. In the first one, the fireplace almost disappears and blends into the wall. In the second one, the colour serves as a frame to highlight the fireplace area, whilst retaining a neutral context in tones of grey.